Why are Betta fish in small bowls? The shape of the bowl minimizes the surface-to-air ratio. This is the proportion of how much water surface is exposed to air as opposed to the rest of the water. The higher the ratio, the more oxygen will dissolve into the water, allowing the fish to breathe more easily. The rectangular form of an aquarium alllows for a larger surface-to-air ratios, keeping O2 levels up. If you buy a pet, whether it's a fish or a dog, it is your responsibility to make sure s/he gets the best care possible under your ownership. Animals are not toys- they are living creatures and need to be respected and treated right. This includes fish. 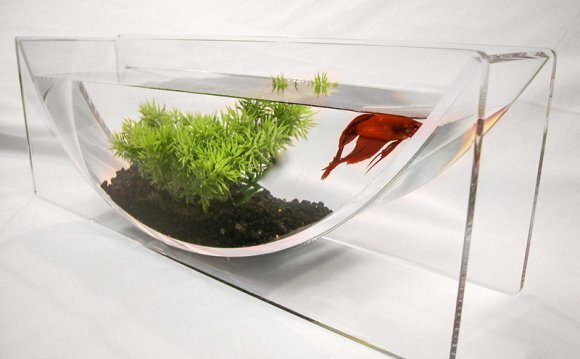 If you're keeping a fish in a bowl, do the right thing and buy a proper aquarium!